Betta is a very beautiful fish and so is it highly sensitive. From getting irritated to getting depressed it has a lot of little fragments which can result in degradation of its health. But, you need not worry about it being sick if you have these precautions kept stored in your mind during fish tank setup. Prevent poor quality of water especially when kept in a smaller fish tank/bowl to avoid parasite breeding. Keep a regular check on the temperature fluctuations and maintain steady water temperatures. Huge temperature changes may make it sick. Look out in case of small tanks that the waste products of the fishes do not accumulate in one place for long. It leads to bacterial breeding which is harmful for the Betta. But, a fish can still get sick even after taking all these precautions. So, you need to keep a regular check on your little friend to observe these following different identifications of Betta fish diseases. In a healthy fish, the fins will always be whole but as it gets sick, its fins may start getting ripped or have holes in it. Also, the fins look clamped downward towards the body and are not fanned properly. You will observe that the Betta fish is not usually very active and can note down its activities accordingly. But if it gets sick its movements go down to a drastic level. It may also spend more time in the dark corners than usual. A sick Betta fish usually changes its behavior towards diet on a huge level. And when it comes to the Betta fish it clearly stops eating any food altogether. If your fish is uninterested in eating anything, it is probably sick. 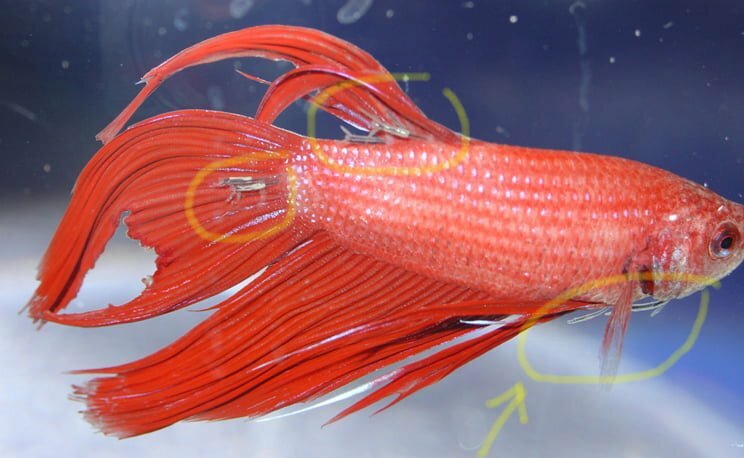 If your Betta is sick, it may develop spots on its body which are mostly white in color. The main portion of the spots is on the head and mouth. It is a clear indication of a parasite attack. If your fish swims ashore more often for breathing, it is not able to get enough oxygen from the water and is probably sick. Note: At times, it may be just an indication that you need to take a look at your oxygen pump’s proper functioning. If your fish is trying to rub its body against the glasses of the aquarium, you need to immediately diagnose it for health related problems as it is a clear sign of sickness. If our Betta fish’s eyes are protruding from its head, then they may be swollen and indicate a sign of sickness. If the fish is not able to close its gills completely while breathing, then they are swollen too. You need to get a quick check on its health condition if so. These are all the indications to know that your Betta is sick and you need to get it treated as soon as possible. The treatments of Betta fish are usually not available at normal fish stores or vet clinics. Signs: Swelling in the lower part of body, fish stops eating. If the fish is constipated, it needs to give its digestive system a rest and thus you have to stop feeding it till the swelling somewhat reduces. When you start feeding it again, feed it live food like brine fish or blood worms. Live food is always more nutritious and easy to digest and can be used till it recovers from the sickness. Tip - The diet can be controlled by feeding it only the amounts which last for two minutes of devouring. Reducing its diet permanently - Constipation often occurs when you start over feeding your fish than it should eat daily. So, by the time it recovers from the sickness, reorganise the diet of your fish to lesser amounts. Signs: Dark tail and fin ends, shredded fins, holes in fins. This disease often develops from poor quality of water which is the best breeding ground for fungal and bacterial germs. You need to clean your tank before replacing the water. Bleach the tank with a ratio of 1:20 with water. Keep the fake plants and other decorations in the bleach mixture too. Clean the rocks separately by baking them at 450 degree Fahrenheit. Let them cool down before placing them back in the tank. Rinse the tank dry completely and let it dry preferably in the sunlight for better treatment for 2-3 hours. If it is a fungal infection then only the fungus eliminator will be sufficient to keep the growth out of the water. If it also has tail/fin rot disease, then use tetracycline or ampicillin to treat the fish. Instruction will be given on the packets of the medicines. Read them and follow accordingly. Change the water every 3 days and put the medication back in. Repeat this process for 3 times. If the symptoms disappear by then, you can stop the process earlier too. Signs: Clamped fins, lethargy, rubbing and scratching, loss of appetite, clamped fins. First isolate the fish from the tank into a clean water tank. Bettazing is the best medicine to cure Velvet disease. Just add it directly to the water in the ratio of 12 drops per gallon. You can also use an alternative medication called Maracide. Keep treating it daily till the symptoms disappear. The fish needs to isolated into a clean water tank for treatment. At the same time, the contaminated tank needs to be treated as well as this disease is highly contagious and can affect other fishes in the tank. Signs: White spots on head, mouth, lethargy, loss of appetite, clumped fins. If the Betta is suffering from ich, it can be treated in a large tank by raising the temperature of the tank to 85 degree Fahrenheit. For smaller tanks, the fish needs to be removed first and then the tank water temperature should be increased. Note: Even in the large tanks, the temperature should be raised slowly otherwise it will traumatise the fish and kill it. Water needs to be changed immediately and treated with aquarium salt and water conditioner before placing the fish back into the tank to keep the parasite from coming in contact with your fish again. Aquarisol when added in just a drop per gallon helps the fish to fight the infection quickly. Add the medicine everyday till the signs disappear. Sings: Bulging eyes, swelling on the head. Note: These signs more often indicate Tuberculosis and if true, the fish is likely to die as the disease is deadly and the treatment is least effective. Popeye can be cured by cleaning the tank and changing the water every 3 days. In addition, put aquarium salt and water conditioner to maintain the water condition for at least one week. Ampicillin treats this disease effectively and can result in letting you know that whether it is tuberculosis or not. Add this medicine every time you change the water, till one week after the signs of the disease disappear.